If you have a garbage disposal you know that sometimes they can stink. Getting your disposal smelling fresh again can be a challenge. 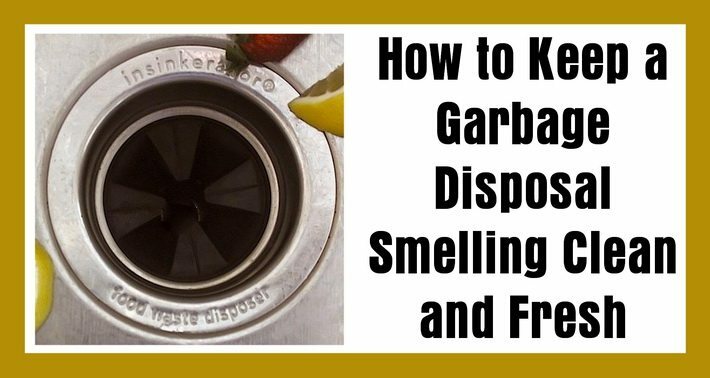 Here are some of the best methods to clean and freshen up a smelly garbage disposal. We all know citrus smells good – cut up lemons into small sections and toss them into the disposal while it’s grinding. Lime and orange work well too. This neutralizes the rancid smell quickly – and cheaply. Make sure to use small chunks. Start with a large cup of ice cubes, then switch it on and add half a cup of kosher salt (kosher salt because it has larger grains than normal salt). This combination removes slime and residue from the impeller blades. Run hot water through it, while turned on, for at least a minute. A little bit of dish soap can help too. If you do this regularly, odor will not build up in the first place. Anyone who tries to avoid chemicals while cleaning knows that baking soda and white vinegar are a magic combination, and they work well on garbage disposals too. Use 1 cup of dry baking soda and 1/2 a cup of vinegar. Then add boiling water. Do not use regular drain cleaners, which contain fine sand or caustic substances that will corrode the inside of the unit and shorten its life. If unsure, check with your owner’s manual. (If you are renting and do not have the manual, ask maintenance what kind of garbage disposal you have and you should be able to find it online). There are a number on the market – read the instructions carefully and use them as directed. First unplug – not just turn off – the unit. Then inspect the unit for large items that might be clogging it. If you find one, remove it with tongs. Then clean the disposal with a dish brush or wire brush. Again, completely unplug and disconnect the unit first – better to be safe than sorry. How about preventing odors in the first place? Here are a few tips for that too. 1. Run the disposal long enough. According to plumbers, most people stop as soon as it sounds like the food is done grinding. Instead, leave it running with the tap flowing for about five additional seconds. 2. Never run fibrous vegetables such as celery or heavy starches through the disposal, as they are more likely to get stuck. Most especially do not grind up potato skins or peelings or banana skins – put them in the trash. 3. Put large food items in the trash not down the disposal. This doesn’t just reduce garbage disposal odors but is better for the environment. 4. Do not put coffee grounds or eggshells into their disposal. They tend to stick to any existing sludge and clog the disposal. 5. Apparently, putting ground glass in the disposal is a thing – don’t do it. It doesn’t work and is likely to cause a clog. 6. Make sure whatever dishwashing product you choose de-greases your dishes. Grease is one of the leading causes of a smelly garbage disposal. Don’t pour large quantities of grease or oil down the drain… let the grease solidify and then put it in the trash. If you follow these tips you will keep your garbage disposal from smelling. And if you have a phantom smell in your kitchen, remember that the disposal is a likely culprit and clean it right away. Keeping your garbage disposal clean will also extend its life, as will not putting anything in it that can cause clogs. Take care of your garbage disposal and your life will be much easier – and smell much better.